Mixing next-generation policy criteria like applications, application functions, users, groups and regions, with traditional policy criteria such as source, destination and IP address, allows you to deploy the appropriate policy. Additional application details you will receive include a description of the application, the commonly used ports, and a summary of the individual application characteristics. Using the application browser allows you to quickly research an application and immediately translate the results into a security policy. Secure application enablement may entail allowing bandwidth intensive applications such as streaming media. You can strike an appropriate balance by using QoS policies that ensure your business-critical applications are not starved of bandwidth by non-work related applications. Every network has a small amount of unknown traffic. Usually, unknown traffic comes from an internal, custom developed application. In other cases, it is an unidentified commercial application, or, worst case, a threat. Regardless of the amount of unknown traffic, it is a concern for you. Use the application control features built into Palo Alto Networks next-generation firewalls to systematically identify, investigate and manage unknown traffic on your network in a systematic way. You will notice a dramatic reduction in the risks posed to you by unknown traffic. Active/passive and active/active high availability are supported by our firewalls, complete with session and configuration synchronization. Active/passive high availability supports traditional network designs in which all network traffic passes through a single firewall. Active/active high availability enables application control and threat prevention if you have an asymmetric environment. Active/passive: The active device continuously synchronizes its configuration and session information with the identically configured passive device. A heartbeat connection between the two identically configured devices ensures seamless failover if the active device goes down. Active/active: Firewalls in an active/active configuration continuously synchronize their configuration and session information. If either device fails, a heartbeat connection signals the other device to take over all of your operations. This ensures session continuity if a device or network fails. To better support asymmetrically routed environments, you can deploy two devices in an HA configuration with either virtual wire interfaces or layer 3 interfaces. App-ID and Content-ID are fully supported in asymmetric environments. Active/active also incorporates flexible layer 3 deployment options supporting load-sharing and interface IP failover. When your network experiences heavy traffic, our data plane and control plane physically separate to ensure that firewall management access is always available to you, irrespective of your traffic or management load. The data plane houses dedicated processing and memory for networking, security and content inspection; the control plane houses dedicated management processing and memory. The PA-4000 Series also supports dual hot-swappable power supplies. The familiar look and feel of our policy editor, combined with drag-and-drop objects and rule tagging, will allow you to establish a policy management workflow that suits your administrative processes. The policy-browser allows you to quickly create policies that include application, user, and traffic specific threat prevention (IPS, Antivirus, Anti-spyware, etc. ), thereby eliminating the duplicate data entry common in other offerings. Object drag-and-drop reduces administrative effort by allowing you to reuse the policy objects (users, applications, services or IP addresses) that you have already created. Rule tagging allows you to “tag” rules with common names (e.g., DMZ, perimeter, datacenter) so that you can easily search and manage those rules as needed. Your operations staff can be given access to the firewall and networking configuration. Your security administrators can be granted control over security policy definition, the log viewer and reporting. You can allow key individuals full CLI access, while for others the CLI may be disabled. All administrative activities are logged so you can see the time of occurrence, the administrator, the management interface used (web interface, CLI, Panorama and the API), and the command or action taken along with the result. Browse ACC, view logs, and generate reports across all your firewalls from a central location. Use device group and templates to centrally manage your firewall configurations, regardless of location. Manage device licenses and updates for software, content, and clients (SSL VPN, GlobalProtect). By using the same user interface as our individual firewalls, Panorama eliminates the learning curve associated with switching from one mechanism to another. Regardless of the task at hand, the steps you may need to take will be the same. A rich set of industry standard management interfaces, combined with a helpful set of APIs, allows you to integrate with existing third-party solutions for superior policy/configuration management, log analysis, reporting and more. APIs: A REST management API and a User-ID XML API give you a powerful set of tools to streamline operations and integrate with existing, internally developed applications and repositories. Syslog and SNMP v2/3: All logs can be sent to your syslog server for archival and analysis purposes, while SNMP v2/3 support enables integration with a wide range of third-party tools. Netflow: Export your IP traffic flow information to a Netflow connector. Separate template records are defined for IPv4, IPv4 with NAT, and IPv6 traffic, while PAN-OS specific fields for App-ID and User-ID can be optionally exported. Netflow integration is not supported on the PA-4000 Series. In addition to our management interfaces and APIs, the Palo Alto Networks Technology Partner Program makes information available to you on many leading management, reporting and analysis vendors. Multi-tenant managed services: Within a managed services environment, it's very cost-effective to have a single device support distinct firewall instances. This allows you to deliver security services to multiple customers with just a single device. The breadth of functionality and configuration flexibility we provide lets each customer select from a menu of service offerings, each of which can be enabled and disabled quickly and effectively. Role-based administration allows you to enable your customer to have access to certain functions (such as logging and reporting), while hiding or providing 'read only' (policy editor) access to other functions. Departmental services: If you're a large organization, certain technical or compliance requirements may dictate that departmental traffic be protected by a unique firewall instance. On an internal network, a single firewall instance with virtual systems support is extremely cost-effective. Each department can be assigned security services from the 'menu,' and then billed back for those services to demonstrate a return on investment. Just like in a managed services environment, you can allow department staff to have either 'read only' or full access to certain firewall functions while the device is centrally managed by IT. Network segmentation is considered to be a network security best practice because it enables your IT department to isolate and more effectively protect critical data. By creating a virtual firewall for a segment of your network, you can protect key content from unapproved access as well as threats and possible data loss. Virtual systems are just one way that you can easily segment your network with Palo Alto Networks. Each virtual system is a self-contained, fully operational Palo Alto Networks firewall, complete with separate management interfaces. This ensures that other customers or departments can only see or modify their own policies. Within each virtual system, role-based administrative access control allows you to delegate feature-level administrative access (enabled, read-only, or disabled and hidden from view) to different staff. Using role-based administration, service providers can build a menu of services to selectively enable, while enterprises can delegate access to key individuals as needed. Using a combination of Device Groups and Templates, your team can quickly configure one of our firewalls remotely and then deploy new or updated global policies that co-exist with local policies. The combination of global and local policies allows you to ensure compliance with internal or regulatory requirements, while local device rules maintain both security and flexibility. Granular role-based administration complements shared-policies by allowing you to assign specific tasks to different members of your team, thereby ensuring appropriate separation of roles and responsibilities. With the same look and feel as the web interface, Panorama gives you visibility into the applications, users and content traversing your devices along with granular logging and reporting - all at both a global or individual device level. Visibility: With the same look and feel as the web interface, Application Command and Control (ACC) in Panorama gives you a global or individual device view into the applications, users and content traversing your network. The end result is that you will know more about the traffic and activity on your network and can make more informed security policy decisions. Logging: For either an individual device, or all devices, Panorama administrators can quickly view log activities using dynamic log filtering by clicking on a cell value and/or using the expression builder to define the filter criteria. Results can be saved for future queries or exported for further analysis. Log Forwarding: Panorama can aggregate logs collected from all your Palo Alto Networks firewalls, both physical and virtual form factor, and forward them to a remote destination for purposes such as long term storage, forensics or compliance reporting. Panorama can forward all or selected logs, SNMP traps, and email notifications to a remote logging destination such as a Syslog Server (over UDP, TCP or SSL). Reporting: Predefined reports can be used as-is, customized, or grouped together as one report to suit specific requirements. In addition to ad hoc reporting, custom and predefined reports can be scheduled and exported in a variety of formats. 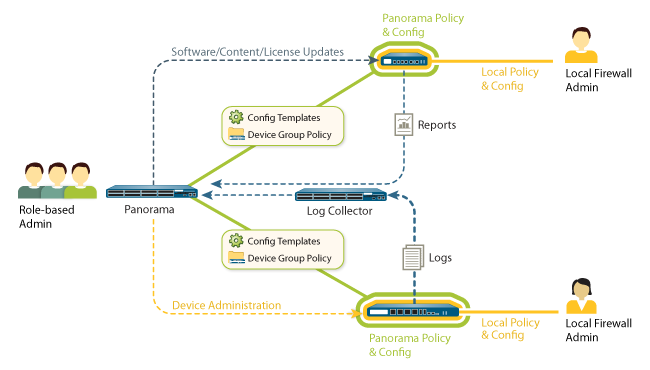 Panorama allows you to take the systematic approach of first qualifying a change to the firewall in a controlled environment, then delivering it to the production firewalls. From a centralized location, you can manage software updates, content (application updates, antivirus signatures, threat signatures, URL filtering database, etc.) and firewall licenses. Security best practices dictate that you strike a balance between being proactive, continually learning and adapting to protect your corporate assets, and being reactive and investigating, analyzing and reporting on security incidents. ACC and the policy editor allow you to proactively deploy application enablement policies, while a rich set of monitoring and reporting tools enable you to analyze and report on the applications, users and content traversing your network. Our firewall maintains logs for WildFire, configurations, system, alarms, traffic flows, threats, URL filtering, data filtering, and Host Information Profile (HIP) matches. You can quickly analyze network activity by clicking on a cell value and adding multiple criteria using the expression builder - the results can be stored for future use or exported to CSV for additional analysis. In addition, all logs can be sent to a syslog server for analysis by a wide range of third party solutions. Behavioral botnet report: Data regarding unknown applications, IRC traffic, malware sites, dynamic DNS, and newly created domains is analyzed with the results displaying a list of potentially infected hosts that can be investigated as members of a botnet. PDF Summary report: A fully customizable one-page summary report that includes data for the top five in each category as well as trend charts that are not available in other reports. User-activity report: Allows you to generate a time-based report that shows application and web browsing activity for specific users. App-Scope: Complementing the real-time view of applications and content provided by ACC, App-scope provides a dynamic, user-customizable view of application, traffic and threat activity over time. Our firewall allows you to send all the logs to a syslog server for archival and analysis purposes. In addition, we have a wide range of proven technology partnerships with nearly all of the SEIM vendors.